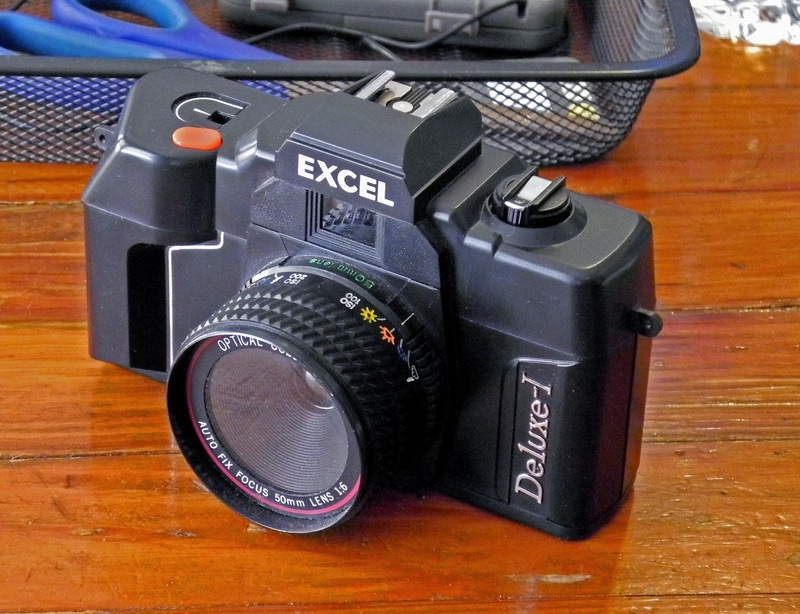 I thought I would indulge my fascination for cheap plastic camera this weekend, so may I present the Excel Deluxe-I. A thrift store find, this plastic wonder has all the styling of a 35mm SLR, with none of the features. Exposure Control: Manual via aperture setting "Full Sun," "Half Sun," "Cloud" and "Flash"
Film Advance: Manual via knurled dial. Other Features: Built in hot shoe for flash, built in clear lens protector, Frame counter, Tripod Socket, Raise hand grip and Red shutter release button. I am pretty sure the body has a lead weight in it as the camera seems to weight more than I would expect from its plastic construction. My first roll through this camera is hanging to dry, test scans will be posted soon. Who ever designed it made a good attempt at recreating a SLR. I have a Kinon SL3 which is similar, it took the most gorgeous (I mean light leaks etc) on cheap Agfa Vista Plus 200 film. Its great to experiment with toy cameras, Ive found the results to be widley variable but extremely interesting. This one doesn't leak, but is does like to mis-frame, but I love the lens..